Flu shots are now available at the Health Department every Monday and every Friday (except holidays). We are open from 8 a.m. to 4 p.m. as a walk-in clinic for vaccinations. Ashtabula County Health Department Flu and Immunization Clinics are open every Monday and every Friday. Welcome to the Ashtabula County Health Department website, your online link for public health services in Ashtabula County, Ohio.Residents of the Ashtabula County General Health District are encouraged to familiarize themselves with this website and learn more about the diverse public health services offered by the Ashtabula County Health Department.Residents of the Ashtabula County Health District may also contact the Ashtabula County Health Department for more information concerning programs and services offered by the Ashtabula County Health Department by contacting us at 440-576-6010 Option 3. 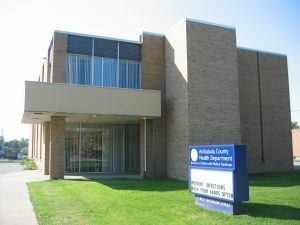 To promote and protect the health and well being of the residents of the Ashtabula County Health District by reducing preventable illness and controlling the spread of communicable diseases.The Ashtabula County Health Department carries out its mission by providing programs and services in communicable disease prevention, chronic disease prevention, health promotion, immunizations, environmental health and health education.The public health services of the Ashtabula County Health Department are a blend of education and enforcement services designed to protect public health in the Ashtabula County Health District.